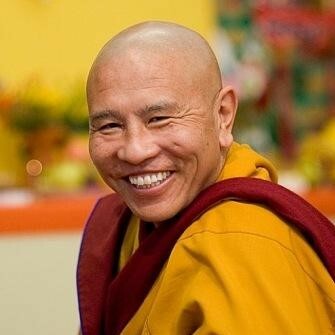 Jhado Rinpoche will guide us to cultivate new ways of thinking, by explaining the entire path to enlightenment on the basis of a well-known lam-rim text, “Foundation of All Good Qualities” (Tib. Yonten Zhi Gyurma). This 14-verse poem gives a sweeping overview of the stages of the path to enlightenment (Tib. lam-rim), from relying on a qualified guru up to the esoteric practices of the Vajrayana. We should think of lam-rim practice and thought transformation as the essential practice of Dharma—as important for our everyday life as eating or having a means of living, things that are vital for staying alive. We feel discomfort if we don’t have a means of living, and naturally we feel that it is extremely important to have food and drink. Without these things there is no comfort, but lam-rim practice and thought transformation are even more important. We have to remember the advice of the lam-rim meditations and teachings and the incredibly skilful methods of Mahayana thought transformation, and we should keep this in our heart as more important than place and food and a means of living. There is no opportunity for us to practice Dharma if we have not received or met the teachings and until we meet and understand the teachings, we can’t stop life’s confusion and problems. We can’t control our disturbing thoughts and we can’t transform undesirable conditions into desirable conditions, and problems and suffering into happiness. If we have met and received the Dharma, the graduated path to enlightenment, it brings much more than just some peace of mind for a while or a little bit of calmness for one or two hours—like the psychological methods used by people who help others to stop depression, aggression and other problems. This 3-night series is suitable for all levels. Drop in on any session. Guest rooms are available—single and shared, please call the front office at 831-462-8383 or book online here.